"The Die Is Cast:" February 26th, 1859!! : OCEANS, Inc. IMAGINE … it is 1859 … in antebellum Georgia … Savannah … at dawn. You have just picked up a newspaper, The Savannah Daily Morning Newspaper, to be exact. Now, don’t get confused if you live in contemporary Savannah and you may have picked up The Savannah Daily Morning Newspaper today (for real), February 26th, 2017—but, no, imagine for a minute, that you are reading the same newspaper, back on February 26th, 1859…. SALE OF 440 NEGROES! 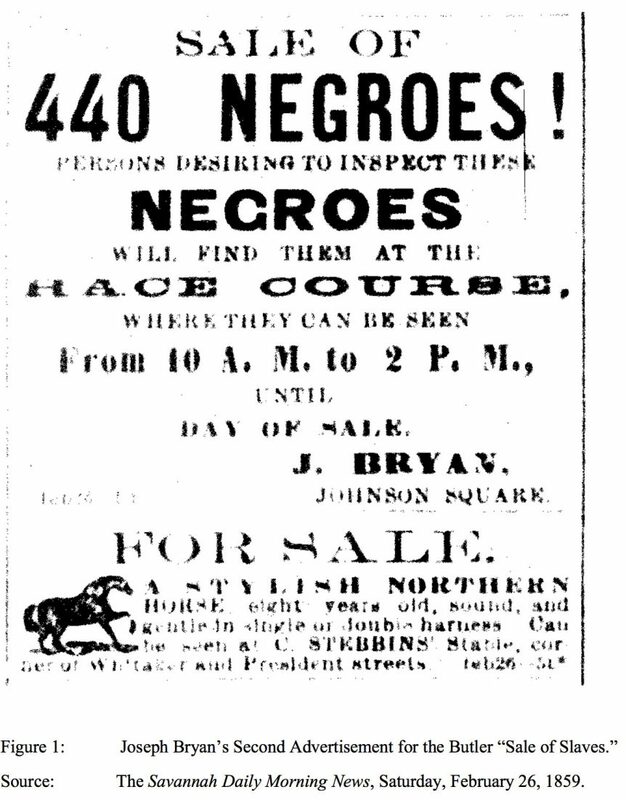 PERSONS DESIRING TO INSPECT THESE NEGROES WILL FIND THEM AT THE RACECOURSE, WHERE THEY CAN BE SEEN FROM 10:00 A.M. TO 2:00 P.M., UNTIL DAY OF SALE. The advertisement was succinct (the emphases are original), with a brevity that belied the atrociousness of the population and genealogical dispersal that it would precipitate. This would become the largest slave sale in recorded American history, known as the “Weeping Time.” Many bars and hotels in Savannah had already filled up in anticipation of the slave sale / auction by February 26, 1859, and the town was agog with excitement. Yes, some people were very excited at the prospects of an event that others verily dreaded. The enslaved would eventually number 429 who would be sold from Savannah’s erstwhile Ten Broeck (horse) race course, about two and a half miles west of the city, on the following March 2nd and 3rd. By Saturday, February 26th, 1859, only the first group (about a hundred enslaved persons) had disembarked at the racetrack—actually arriving a day earlier, on Friday, February 25th. They had been brought up via train or sailing vessels from the Darien and St. Simons Island, Georgia area, just downcoast from Savannah. They had been enslaved on two plantations—Butler Island rice plantation, and Hampton Cotton plantation, both owned by the Butler family of Philadelphia, Pennsylvania. The sale had been authorized by Pierce Mease Butler (1809-1867), slaveholder, who was selling his “people” because he was in debt from gambling and stock market losses. Anyway, let’s imagine, finally, that dusk is falling, in Savannah, on February 26th 1859. The enslaved are settling in for certainly rough nightmares in the stables (no pun intended). The horse stalls at the race track will be filling up daily for the next week with arrivals of more Butler enslaved to be sold, ultimately, on March 2nd and 3rd, 1859. And more people from plantations around the American South will be coming by to inspect the enslaved, in plans for the impending auction days. I will fill in the details of the slave sale at this same blog site on March 2nd and 3rd, 2017. However, IF you’d rather not wait, and want to get the details sooner (the advantage of living in the present, with history as hindsight), please check out a fuller version of this real history at “Unearthing the Weeping Time,” at https://southernspaces.org/2010/unearthing-weeping-time-savannahs-ten-broeck-race-course-and- 1859-slave-sale. Thank you, and do light a candle for these former enslaved and for their descendants. And do pass this history on. 1 “The Die is cast,” refers to a decision or action that is not reversible; portending an inevitable follow-through of consequences based on the decision or act. The phrase, from the Latin, “Alea iacta est,” is attributed to, and popularized by, “its use by Suetonius when Julius Caesar crossed the Rubicon to begin a civil war in the Roman Republic, indicating the commission of an irreversible act.” (https://en.wiktionary.org/wiki/the_die_is_cast). 2 Joseph Bryan had advertised the slave sale originally on February 8th in the Savannah Republican newspaper. He placed a copy of this advertisement from February 26th also in the Savannah Republican, and they run concurrently till the sale was concluded (except on Sundays). See a copy of the actual advertisement in this article. 3 For the full version, see Q. K. Philander Doesticks, “Great auction sale of slaves at Savannah, Georgia, March 2d and 3d, 1859.” Reported for The Tribune (New York, Anti-Slavery Society, 1859).